1. Remove the ceiling fan from the ceiling. If you are not comfortable working with electrical, call an electrician or someone who is familiar with lighting. Disassemble the fan, keeping all of the parts together so they don't get lost. You'll need them later! 2. Spray paint all of the blades and non-electrical components of the fan white and let dry. Do a second coat once they've dried, spraying the edges as well. 3. Begin screwing the connectors into the outlet attached to the fan. Continue branching them out until you are happy with the arrangement. 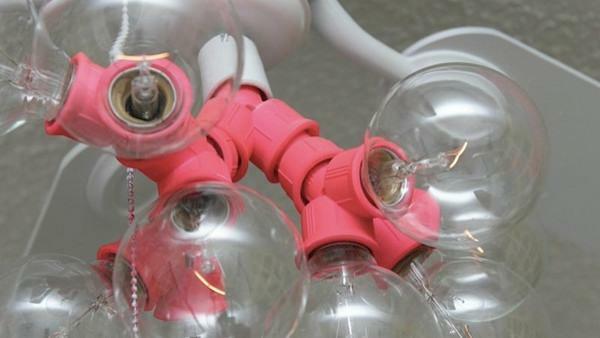 Fill each socket with a cotton ball, and spray paint the entire piece your desired color. We went with a matte neon pink which we thought was just to die for! 4. Re-assemble the fan and attach the branched light part to the fan. Hang the fan back up (again - find an electrician friend if you are unfamiliar with electrical!) Done and done! This fan light fixture not only casts a lot of light, but is a feature you can't ignore!